Leading hospitality company Orascom Hotels & Development recently celebrated the reopening of Taba International Marina; a milestone toward supporting the recovery of tourism. The ceremony was attended by top government officials including Prime Minister Dr Hisham Qandil, Tourism Minister Hisham Zaazou, Governor of South Sinai Khaled Foda, Minister of Transport Dr Mohamed Rashad El Meteiny and Minister of State for Antiquities Mr Mohamed Ibrahim. Senior Jordanian officials included Minister of Tourism and Antiquities Nayef Al Fayez, Jordanian Ambassador in Egypt Hisham El Khaswana, Dr. Kamel Mahadin, commissioner of Aqaba Special and Mr. Ghassan Ghanem, Chief Executive Officer of Aqaba Development. Granted an international tourist marina license in 2005, with several million dollar investments Marina is expected to facilitate the transport of over 250,000 passengers each year. 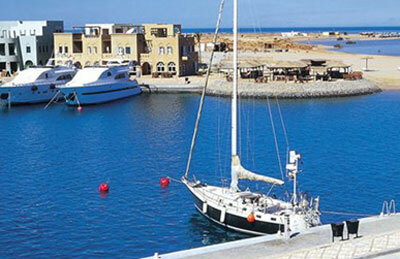 Zaazou emphasized the Marina’s vital role in supporting intra-regional tourism. "Taba Marina is essential in revitalizing tourism between Egypt and Jordan, accounting for a total of 350,000 tourist arrivals to Egypt annually. Reopening it actively demonstrates the effective collaboration between various ministries towards the collective goal of supporting the recovery of tourism," said the tourism minister. He pointed out that the Marina’s re-inauguration was a testament to the region’s safety and security; an essential prerequisite for the recovery of tourism. “Taba Marina is an economic lifeline for thousands of Egyptians living in Sinai, and its re-inauguration contributes substantially to their livelihoodand prosperity; a definitive government priority,” he added. “The government’s tremendous support to successfully reopen Taba Marina demonstrates the collective commitment to support tourism in Egypt” remarked Samih Sawiris, the chairman of Orascom Development. Spanning an area of 4.3 million sqm, Taba Heights features six operating hotels with 2365 rooms. "As Orascom’s second self sufficient resort, we have the infrastructure in place to boost tourism revenues from this region. The reopening of the Marina addresses security misconceptions that have recently hampered tourism in this area," said Hamza Selim, the chief destinations management officer.